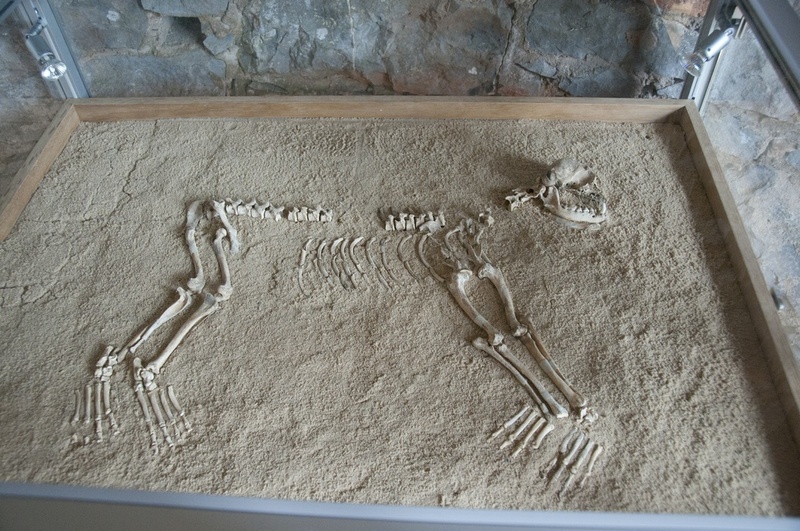 Portumna Castle's ground floor includes this glass-case display of a small dog's skeleton. was Interred near this Place. "Local tradition has it that Fury was asleep on the grass underneath one of the windows of the castle when a young lady of the house, while watching Fury below, fell from the window. The young lady landed on the dog breaking its back which resulted in the dog's death. The dog, which saved her life, broke the young lady's fall and in gratitude the family first placed this plaque on Fury's grave. "As the photographs here show, the excavations that were undertaken in 1998 revealed Fury's grave. The presence of nails in each corner of the gravesite indicates that she was buried in a coffin. The type and size of the skeleton leads us to believe that the dog was a Whippet and the position of the spine would seem to suggest that it died of a broken back."